A pioneer of self-therapy offers a powerful method for healing and awakening on the spiritual journey. Inside each of us, there are many distinct selves. “Though we’ve been raised to believe that healthy people have a single ‘self,’” explains Dr. Richard C. Schwartz, “acknowledging our multiplicity gives a far deeper awareness of how our minds actually work.” Dr. Schwartz’s pioneering Internal Family Systems (IFS) therapy has become renowned in psychotherapy for its power to help us connect with and heal the many distinct facets—or parts—of our psyche. With Greater Than the Sum of Our Parts, he brings you a practical training course for using this method for your growth, well-being, and especially your spiritual journey. One of the key lessons of IFS therapy is that there are no bad parts. “Trauma or life experience can cause our parts to take on burdens,” says Dr. Schwartz. “Yet when we bring the spiritual values of curiosity, gratitude, and kindness to these burdened parts, we discover incredible opportunities for healing and awakening.” Through instruction and guided meditations, Dr. Schwartz shows us how to engage even the most disturbing or unwanted parts of our psyche with openness and love—so we may unlock the hidden gifts and wisdom each part contains. Many forms of therapy and even spiritual practice inadvertently put us in conflict with ourselves as we try to transcend or reject our parts. 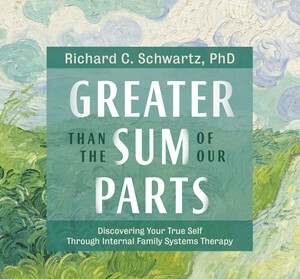 With Greater Than the Sum of Our Parts, Dr. Schwartz invites you to embrace each of your many parts with self-compassion—and discover the inclusive greater Self that is your true, divine nature.